What Can We Learn From Tasmanian Devils? April 29, 2014 in Animal Stories and Principles, Careers, What Can We Learn From... ? 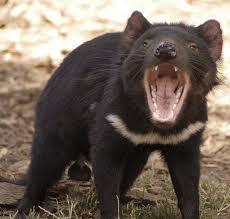 Tasmanian devils are truly remarkable creatures. An endangered carnivorous marsupial that is endemic to the Australian island of Tasmania, they have developed a fearsome reputation, despite their small stature. One of the devil’s most impressive features is its extremely powerful jaws and that leads me to an important lesson. My dad grew up on a farm in Tasmania and he told me of devils who had been caught in traps that had chewed their own legs off to escape. I’ve always found that to be an extraordinary trait. They get caught in a trap and they are desperate enough to do anything to get out. As a life and career coach, I meet a lot of people who say that they feel trapped in their current work situation. They say that they want to get out, but they can’t. Or maybe they just aren’t desperate enough. Too often people wait until they have hit rock bottom before they are desperate enough to make the changes necessary to break free from their situation. Don’t wait that long, start planning your escape now. If a Tasmanian devil is willing to chew through its own leg to get out, what are you willing to do? Are you willing to study to develop new skills that will enable you to change vocations? Are you willing to start a part-time business that could turn into something full-time? Sure it may take some extra work. It may take more time than you would like. It may even hurt a little. But don’t say that you’re trapped. Because if a Tasmanian devil can find a way to escape, so can you! Thanks Nancy and I hope that your husband is able to find a role that suits his capabilities. It’s never too late!